Tulum, walled city, city of warriors, yesterday and today. Tulum is located on a cliff top overlooking the turquoise Caribbean. If you want to enjoy the forces of nature and the most azure sea in the world, come to Tulum. Transportation is via a comfortable air-conditioned motor-coach. A professional bilingual guide is on board explaining the history of these beautiful Mayan ruins. Chichén Itza is one of the greatest remnants of the Mayan civilization from the Yucatan Peninsula of Mexico, and was voted as of the new Wonders of the World, joining ranks with the Great Pyramid of Egypt and the Taj Mahal. It is two cities: one was ruled by the Mayans from the 6th to the10th century A.D. and the other was a Toltec-Mayan city that emerged in 1000 A.D. The site combines Toltec and Mayan influences and is full of cosmological symbolism. Its four sides contain 365 steps, 52 panels and 18 terraces (for the 18 months of the religious year). The site also contains a cenote (limestone sacred well or sinkhole) and an observatory, and Mexican buffet on The Mayaland Restaurant. A knowledgeable English speaking guide will be on board to explain the history of these beautiful Mayan ruins, in addition to the viewing of a Mayan documentary film. A XI Century city, one of the most impressive ceremonial centers in the Yucatan peninsula, you will witness the incredible decoration of their temples and plazas. Admire the unique sculptures in high relief that have surprised archaeologists and scholars. These sculptures support the recently restored jaguar mouth in the front of the main temple. Imagine the rituals that took place in the ball game (Pok Ta Pok) and take a photo at the false arch, one of the architectural icons of the Maya culture. Coba is an ancient Mayan city in the state of Quintana Roo, located 172 km from Cancun, and about 90km from Chichén Itza. Enveloped in the deep green of the tropical jungle, this ancient Mayan city rises up between two lagoons. In its era of splendor the site extended over 75 sq. km. The city is composed of various Mayan communities: Cobá, Chumuc Mul, Nohoch Mul, Las Pinturas, Macanxoc and Kukulcan being some of them. From Nohoch Mul, the tallest pyramid on the north of the peninsula with its 42 meters (46 yards), the view over the jungle that extends to infinity is unbeatable. Cancun has been named one of the Best 20 places for billfishing and also provides excellent game for light tackle. The warm waters that you will be fishing in have currents of different intensities resulting in nutrients from turbulence caused by local reefs, islands, and points, beginning the proverbial food chain that attracts an extensive variety of fish The game fish you will most commonly find are Bonito, Tuna, Wahoo, Barracuda, Grouper, and Mutton Snapper. Scuba Diving in the blue waters of Cancún is an unforgettable experience. All dives include: US Divers equipment, refreshments, PADI instructors, comfortable and equipped diving boats. 2. Practice in a pool, with one tank for 40 minutes. You don’t have to dive to enjoy the incredible coral reefs. We have terrific Snorkel Tour to the Best Snorkeling Reef in Cancun where you’ll find a spectacular show of marine life. Come and see the over 100 forms of exotic and colorful marine life forms that only Cancun has to offer, with the world’s second largest reef. 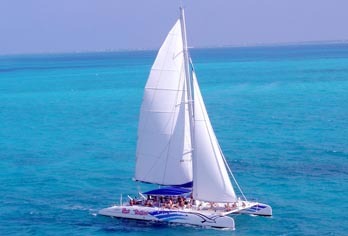 Together we’ll sail the crystal clear waters of Isla Mujeres on a brand new 75 ft Maxi Catamaran! The friendly crew will guide you to an unforgettable sailing, snorkeling and exotic experience. You’ll love the activities, relax on a private beach and enjoy our open bar surrounded by new friends within a tropical environment. Dolphin Discovery is one of the most exclusive and beautiful dolphin centers in Cancun, featuring state-of-the-art facilities and a friendly family of Pacific Bottlenose dolphins! Our programs begin with an educational presentation. This introduction will give you a deeper understanding of the Pacific Bottlenose dolphins’ physiology and environment. Following the orientation, we’ll begin our thrilling dolphin swimming experience. You will first become acquainted with your dolphin through petting, hugs, and kisses. Then, taking the relationship one step further, you’ll have time to swim and play with your dolphin, while experiencing the thrill of up-close and personal contact with these fascinating marine mammals. An incredible combination of Mayan culture, breathtaking natural treasures, and unforgettable adventure activities! Your journey begins with a bike ride through the farmlands of Don Silvano where you will enjoy the surrounding jungle scenery and learn about local Maya subsistence farming. You will arrive at an extraordinary system of Cenotes where you will be swimming and snorkeling in their crystalline waters. Then you will set out on a flight over the jungle’s foliage and Cenotes on a series of the most thrilling zip-lines of Mexico, the last zip-line measuring 160 meters long! Your journey will end in the mystic dry Cenote of the legendary Aluxes where you will witness a traditional Maya purification ceremony and learn of the religious and cultural importance of the Cenotes to the Maya people. Cancun offers one of the world’s greatest diving and snorkeling areas. Hosting more than 500 species of tropical fish, the Cancun shoreline is protected by a series of magnificent coral reefs that stretch from Cabo Catoche to the border with Belize. The crystal-clear water and abundant marine life of these coral reefs can be explored at Punta Nizuc part of the second largest reef in the world!! Imagine driving your own speed boat through the jungle experiencing tropical birds, exotic plants and marine life. Experienced guides will lead you through the dense mangroves to the Caribbean. Your exploration at Punta Nizuc will include amazing fish, marine life, and the gorgeous teal water of Cancun. Drive your Paradise Indiana Joe ATV through tropical scenery full of action and speed. Spend 45 minutes on a four wheel ATV; you will be in control of your own vehicle with a professional guide to lead the way through the terrain and jungle paths. Ride past secret white sand dunes, magical wilderness and stunning Caribbean views. An exciting and different form of enjoying the jungle and the sea. Discover nature on well trained horses. The experienced English speaking guide will accompany you through the mysterious and fascinating jungle or you can ride on the wonderful beaches and coves and enjoy a refreshing swim in the beautiful clear waters. Upon returning to the ranch a Mexican lunch with quesadillas, rice and beans and cold drinks will be waiting for you. The incredible ecological park inhabited for more than 1000 years, was one of the most important ceremonial centers and Mayan landmarks. This exotic slice of paradise with its magnificent white beaches and lagoon, canals, cenotes, caves, rivers, subterranean caverns and an imposing archaeological zone is a must. Xcaret has been transformed into an amazing recreational park by ecological people concerned with preserving the environment. 5 different restaurants are open to welcome your group with special menus for lunch. Lunch is not included in the tour rate. Xcaret’s nightly show is a magical sensory experience: an epic celebration with all the color and excitement of Mexico’s Golden Era festivals, plus all the mystery and magnificence of the ancient Mayan kings. Xplor is a unique underground world, with 7 amazing circuits that invite you to rediscover your emotions and senses within nature. Dare to ride our 13 zip lines among the Caribbean’s lively nature and enjoy refreshing water landings and amazing suspension bridges; take a trip through the jungle on unstoppable amphibious vehicles, explore an underground paradise where you can swim surrounded by amazing stalactites and stalagmites, discover a matchless raft route across stunning subterranean caverns while paddling with your own hands, and to complete your feat, a nutritious and light buffet, that will recharge your energy. All this awaits you at Xplor. In Xel-Ha you will find yourself in a natural park that offers activities which immerse you in an underwater world. The activities will let you see marine life in their natural environment, by snorkeling, swimming or diving. Xel-Ha is always the perfect choice to be close to nature. Transportation via luxury first class air-conditioned motor-coach. Amenities include on board bathroom and bottled water. 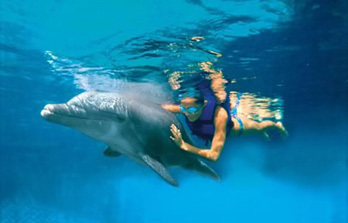 You can also choose the following activities with additional cost: Scuba, Sea trek, Aqua Adventure or Dolphin Swim. There is a place on Earth to ponder, to dream, to rest, to live, to feel: Garrafón Natural Reef Park, a terrestrial paradise of reefs and cliffs facing the turquoise waters of the Mexican Caribbean. Garrafón Natural Park is known worldwide for its beauty and incredible recreational activities like snorkeling, kayaking and hiking. Peaceful and fun parks awaken your sense. We will ferry over to Isla Mujeres and arrive ready to explore the island’s natural beauty. Guests enjoy all of the park’s facilities and amenities including lots of quality snorkeling in one of the most famous coral reefs in the world. Continental breakfast, lunch, and beverages are included. You can even take a cool bike tour or head into town on a guided shopping tour. Cancun shopping tour is designed to experience a true Mexican town. We include round trip transportation, bilingual guide that will show the main spots in downtown and its history, art galleries, the shopping district and refreshments on board the vehicle, free time for shopping at the town and lunch at the local Restaurant.